So no way would this cute little bunny be plotting and planning something of evil destruction, right? Well we are finding that little Mr. Leo has another shade of Shadow (our previous devious destructo bunny) going on in spite of his cute innocent little bunny looks. When we took him in to the vet at the end of October, everything was normal except she felt Leo’s stomach might be just a bit larger than it possibly should be. It was her first meeting with him though and nothing in any other way seemed wrong or out of the ordinary. So the vet told us to make sure he was eating a good diet to promote good motility of his digestive system and keep up with the weekly grooming of him to keep his excess fur ingestion down. So on Monday Leo gives me a clue that there could be other sneaky little bunny activities that could have gone on that I will have to be more diligent to prevent. We had big problems with Shadow trying to consume anything he could sink his little teeth into. So Shadow had run time when someone was around to be supervising him so that he didn’t completely shut down his digestive system consuming all the household furnishings, carpets, upholstery, pillows, books, papers, sheets, blankets, wood furniture and baseboards. It got so we could tell what Shadow was chewing on by the sound of it. I didn’t think Leo was a carpet chewer like Shadow had been. There weren’t any bare spots or tell-tale little pieces of rug to be seen in his run area. Then on Monday I heard a funny chewing sound from him that I didn’t recognize. When I checked out the sound, Leo had found a way to quietly munch on the rug. This area rug unlike others was not showing bare spots or he was being very careful to not graze too much in one area. It was clear he had eaten some rug as he had a few strands pulled loose and swallowed one before I could get it away from him. So Leo is going to lose some of his free roaming privileges like Shadow did, for the good of his digestive system. Leo didn’t like it when I put him in his pen when I needed to be away from him for a bit on Monday. He has a good-sized pen at 4 x 6 feet which normally doesn’t have the door closed, but he will have to get used to that more often if he is going to try to chew carpet. I will have to check into replacing the area rugs with different ones that are jute or seagrass. We had some larger ones in jute and seagrass with Tigger and Shadow and wanted similar ones with Leo, but were having some difficulty finding them now without a latex backing. We couldn’t keep the ones we had previously as the vet wanted everything that could not sterilized thrown away since Tigger and Shadow had various infections going on at the end of their lives. So it is back to shopping around again for me to see if something is available that would be safer and allow Leo safer free roaming. We’ll be making sure he gets lots of hay and monitoring his overall food intake and bunny poop output to make sure that what has gone in is coming back out. It just really puzzles me like it did with Shadow what the huge carpet attraction is all about. It can’t taste good and Leo has multiple choices in hay available in lots of places around his roaming space. I’ve also put down small straw mats in different areas. He has lots of wood and jute chew toys and some cardboard ones too. So what is the carpet fixation all about? 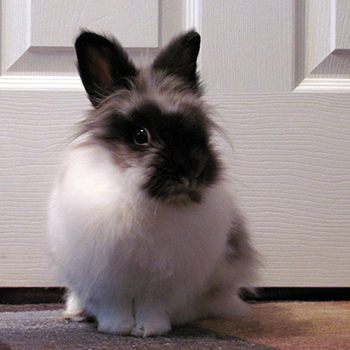 This entry was posted in Bunnyproofing, Leo Bunny Rabbit, Rabbit Care and tagged bunny proofing, carpet chewing, destructo bun, leo the lionhead, shades of shadow by Rabbittude. Bookmark the permalink. Big *sigh* here too. The carpet fascination is hard to understand, especially when we have provided so many safe chew toys and mats, but rabbits are extremely stubborn when they get something in their head as something they want to do. My little Peanut gets some strange comfort from EATING carpet. Besides finding bald spots in the carpet, her poops are strung together by carpet fibers when she’s been munching on it. I’ve stayed diligent about being present when she’s running around the living room, but otherwise keep her in a large tiled corner with cotton rugs that have fibers too short for her to get hold of. Fortunately, it doesn’t seem to have hurt her, as she will turn 15 on her next birthday. Her companion bun does not eat carpet, so it must be an individual thing. That is wonderful that you have had Peanut with you for such a wonderful length of time!